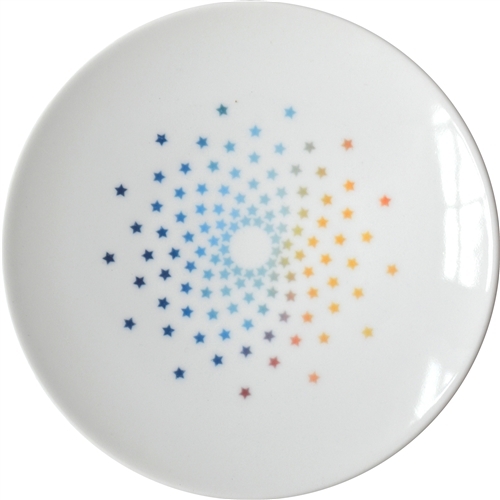 These fabulous small plates feature a unique star pattern reminiscent of summer fireworks. This dish will find endless uses on your table. Bright colors and happy stars are perfect for any celebration. Each plate is perfectly sized for appetizers and desserts, and all sorts of cocktail nibbles. This fine Porcelain plate is handmade in America exclusively for Nourish™. Each plate measures 6.25 inches in diameter. Dishwasher and microwave safe. Complete this cheery look with our Persian Carpet Dinner Plate in Star and our Rainbow Herbal Small Plate in Parsley.